Like lavender, vetiver, though it is also used in feminine fragrances, is almost entirely considered a masculine note: all the classic vetivers, Carven (1957), Guerlain, Givenchy (both from 1959), Lanvin (1964) were launched during the boom of the masculine fragrance market. With its multiple facets – hesperedic, smoky, woody, earthy, balsamic – vetiver is just about as far from floral notes as possible (though, in fact, it does have a faint floral aspect). And like lavender, vetiver roots are associated with cleanliness, since they are used to scent linen and to protect it from moths. Dry and aromatic, vegetal and mineral, vetiver is the polar opposite of the heady and sweet aroma of flowers: to their fleshy opulence, it opposes its angular bone structure. Nevertheless, its salt-sprinkled grapefruit notes do emit a smell that brings this ascetic back to the realm of mere mortals. Vetiver smells of sweat. Fresh sweat after a physical effort rather than the stench that clobbers you in public transports during a heat wave. But sweat nevertheless. It’s faint, but once you’ve detected it, you can’t not smell it. And there’s something virile in fresh sweat, isn’t there? When Chanel launched Sycomore earlier this year as part of its Exclusives, it was received in the blogosphere and fora as the first true masculine of the collection. Granted, with their streamlined bottles, most of the Exclusives – except the über-floral Gardénia and N°22 – could be thought of as shared fragrances. But when I first sampled this beautiful vetiver, with its grapefruit top note and its extraordinarily tenacious woody-smoky base, I immediately thought: “This is for a man”. 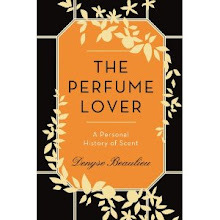 A cultural prejudice, perhaps, reinforced by personal associations: as practically everyone living in France, I know at least five gentleman who wear Guerlain’s Vetiver – along with Habit Rouge, it seems to be the French bourgeois’ default fragrance, just as the French bourgeoise’s is Shalimar or Chanel N°5. So I was quite surprised to learn that Sycomore had been conceived by Jacques Polge, assisted by Christopher Sheldrake, as a feminine fragrance which could also be worn by men. Perhaps to lure women away from filching Guerlain’s Vétiver? After having worn Sycomore on a few different occasions, I discovered that it alternates – perhaps according to weather conditions? – between a woody-smoky scent, a very refined, thirst-quenching vetiver and rounder, sweeter, almost balsamic notes that veer towards amber or benzoin. Somewhere along the ride, I detect a small dose of iris, maybe a smidge of jasmine, as well as peppery notes. While it seems like a very simple composition at the outset – like the other modern Exclusives, it displays the beauty of excellent materials rather than weaving them into the complicated accords of classical perfumery – Sycomore turns out to be rather more complex. In an already crowded field – the nutty Hermès Vétiver Tonka, The Different Company’s salty Sel de Vétiver, the somewhat thinnish reedition of Givenchy’s mythical Vétiver, Frédéric Malle’s Vétiver Extraordinaire with its cedar and cold candle wax notes, Serge Lutens’ unexpected Vétiver Oriental and the vetiver of reference, the Guerlain, which lost a bit of its lustre in recent years – Chanel’s Sycomore is not particularly groundbreaking. But it is excellent. And it offers a quiet, pared-down, chic answer to the question of the gender of vetiver. It is a hermaphrodite. For a review of the original Sycomore launched in the 1930s, see Octavian Sever Coifan's 1000fragrances. 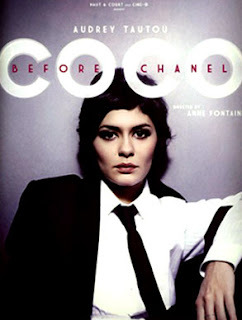 Image: Poster for Anne Fontaine's biopic Coco Before Chanel starring Audrey Tautou, to be released in 2009. I am expecting my very own twig of Sycomore soon, so I will let you know of my impressions then. I am a little surprised to hear of the grapefruit nuances, which undoubtedly must derive from aromachemicals (possibly 3-mercapto-4-heptanone and 3-mercapto-4-heptanol) rather than the natural essence rich in sulfurous matter. It would become simply too much sweat that way! It might make Guerlain headquarters wonder why they haven't made Vetiver pour Elle more readily available, though! And PS. I am very glad that my celebrity perfume list has been embedded so much in consiousness as to provide refs for such masterpieces as Jicky. vetiver and grapefruit notes like methyl pamplemousse were allways good friends. even the natural oil depending on the source might have this kind of notes. The same frendship is true for pineapple and galbanum (from Dynascone to AAG plus the naturals). But vetiver played a major role in many classics of feminine perfumery. Used either as vetiver oil Bourbon, vetiveril acetate, vetivenol and all kind of products derived from the oil. It's important in the soft woody note (powdery) of chypre aldehydic perfumes. I like this note in Crepe de Chine, Arpege, Ma griffe, Djedi. Vetiver + orris and powdery notes gave the very famous base Vetyrisia, present in many classic products. I was told by "those who know" that the grapefruit facet was part of the vetiver oil itself, as Octavian confirms in his own comment. I was referring to vetiver as the starring note: fragrances called "Vetiver" have always been masculine. 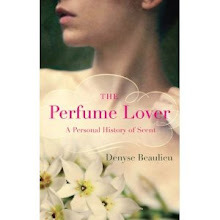 But of course it is a prominent note in many feminine fragrances: yesterday, it popped up in my vintage Bandit. It is also a star player in modern compositions like Vero Kern's Onda, admittedly a non-gendered scent. I do know about the hesperidic odour profile of vetiver (as analysed by Arctander,although I don't recall it as been specified as such, but it's been a while since I read so) but to hear of specific combinations it's wonderful. Thanks. E., if you send me the link to your list of fragrances used by celebrities, I'll add it. It's always interesting to consult it! We agree, encore une fois. While not new, by any means- it is excellently rendered, smoky, and full-figured. No pale, wan, anemic jus this. Dear I., thanks for pointing that out: Sycomore is both full-bodied and tonic, somewhat like N°18 and, even the eau de Cologne of the Exclusives line. An excellent addition, well in keeping with the style of the collection.